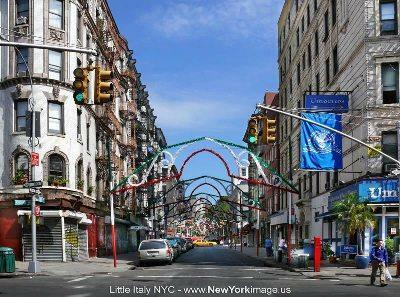 Little Italy, New York is located in lower Manhattan section of Mulberry Street between Broome St. and Canal Street. If your looking for Italian food, this is the place to be. In 2010 both Little Italy and Chinatown were listed on the National Register of Historic Places. Once home to many Italian immigrants, Little Italy has shrunk in recent years. Immigrants first settled in the Five Points region in the 1850's. It is said that the Italian mafia was born in Little Italy and in fact was a local hangout for many infamous mobsters such as John Gotti and Joey Gallo. Joey was shot and killed on Mulberry Street at the corner of Hester Street. Today one of the most notable attractions in Little Italy is the Feast of San Gennaro Street Fair held in September of each year. The feast was so named for the Patron Saint of Naples and not Gennaro Lombardi who some say opened the first pizzeria on Spring Street in 1905. The fair has celebrated Italian immigrant ion to the United States for the last 83 years. Little Italy was also the site of particular scenes from The Godfather movie having shot scenes on Mott Street. Residents of the community have been working with the NYC Parks Department to plant trees along the sidewalks on Elizabeth, Mott, Mulberry, Prince and Spring Streets. Its amazing what a little greenery can do for a neighborhood. If you plug in Mulberry St NYC into Google Maps and head down to Grand Street you can see budding trees scattered along the sidewalks. Residents of Manhattan's Little Italy can join the neighborhood association L.I.N.A. and stay involved with the day to day development opportunities facing the community. You will work with local government agencies to ensure successful improvements and other efforts contributed to the aesthetics of the area such as sidewalk cafe permits, tree planting and bringing in a local library. Recent improvements such as fashionable eateries, buildings adding extra stories and condominiums have improved the lives of all.